Beach living means laid back style. Style that translates day to night, easily goes from playground to cafe; I need clothes that can do it all!! 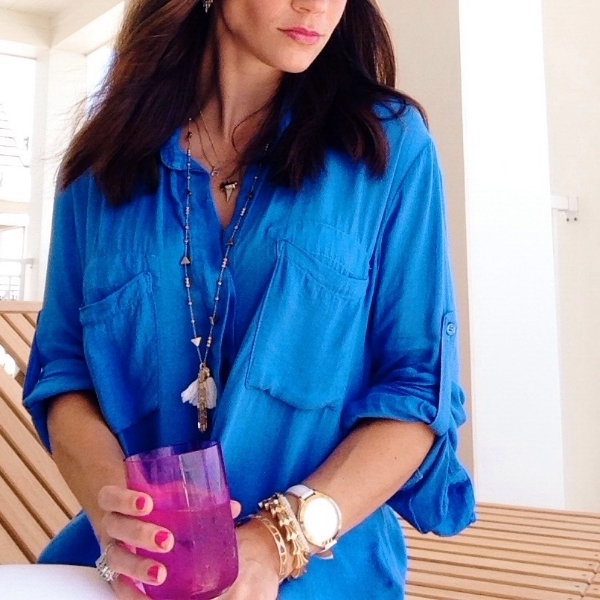 For this outfit post, I'm thinking of the cobalt blue of the deep waters. I often get my color inspiration from nature, and what's more beautiful than the waters of the Gulf?! 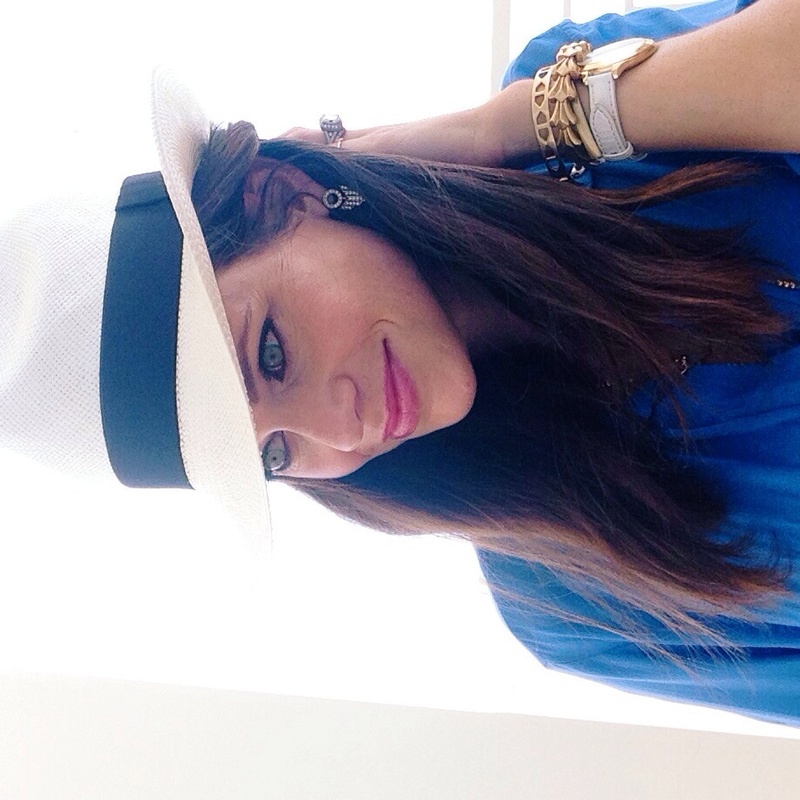 I love cobalt blue paired with crisp white, black, and fuschia accents. Top it off with a hat because it's no secret that I don't believe in washing my hair daily. Ain't no momma got time for that. Bella Dahl tops are meant to be lived in. This brand is a staple in my closet. I love the spilt back (for a quick glimpse of that bootay!) and flowy fit. This easy wearing, lightweight top keeps you covered, but cool during the dog days of summer. I purchased this top from Tulipano Boutique in Atlanta. I really enjoyed shopping there this past weekend. Birkenstocks are back and just as chic as ever. 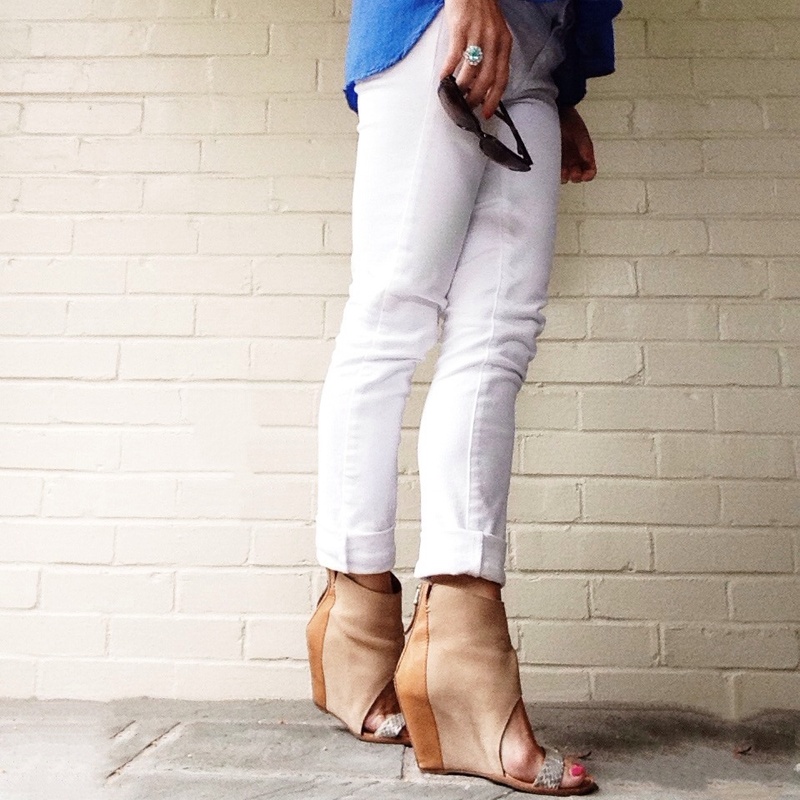 I love this style, The Gizeh sandal, and there are a gazillion color combinations to choose from. In addition to the black, I have a pair in tobacco oiled leather, which is another versatile color. Heidi and the Olsen twins have been photographed countless times in their Gizeh sandals. Warning: Just like you remember from the good ol' days, they did hurt my feet for about a week and a half of constant wearing. I love these goodies also purchased in ATL this past weekend. 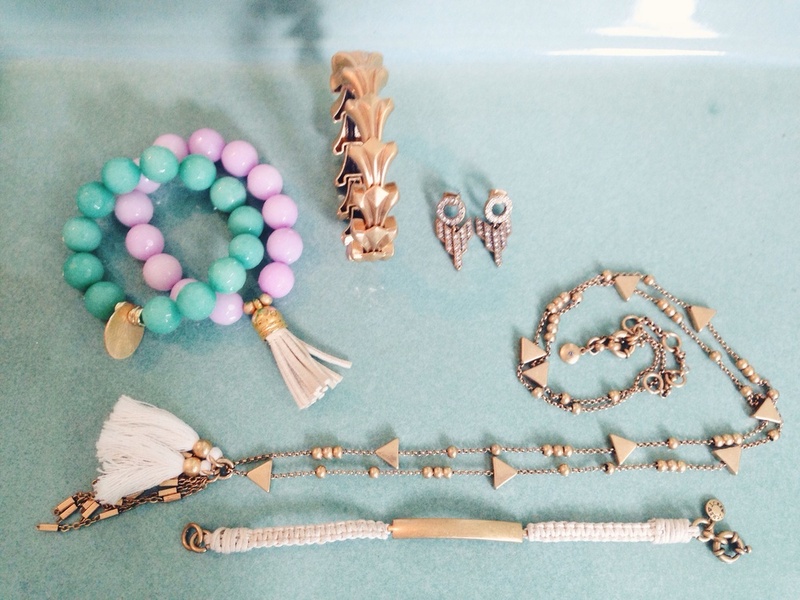 The sea foam and lavender bead bracelets are from Tulipano boutique. The other accessories were found at J.Crew. I'm continuing to show love to the tassel trend. These Art Deco inspired earrings are going to be ones I reach for over and over again. They have the perfect amount of movement and are lightweight. At just $38, everyone should have these in their jewel box. For dinner out, trade the Birks for some heels and you're good to go! In other news, I make incredibly delicious daquiris. My specialty is a fresh peach daiquiri that, I can not lie, is AMAZEballs. They're (in my mind) world famous. It's your lucky day, Fox Den readers because I am going to gift you with my recipe. Get out your blenders! Blend and top with cool whip. After drinking this, you have the potential to be this happy. . .